I stumbled across the old story of Parzival, alternately spelled Percival or Perceval, who was a knight of the Round Table- serving under King Arthur. 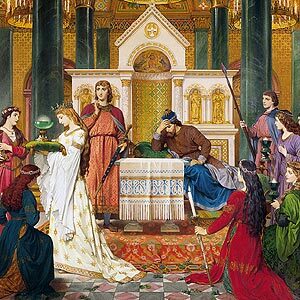 Parzival's story is chronicled in a couple different sources, perhaps most well known the story by Wolfram von Eschenbach, though this has been identified as based on a prior work, Chretien de Troye's work Perceval, the Story of The Grail. The Grail mentioned here is indeed the Holy Grail, the one mentioned in movies and stories, thought to be the cup Jesus Christ used during his final meal, and, some legends hold, the cup that caught his blood when he was crucified. The story of the Grail here does not specifically indicate that Parzival's Grail and Jesus' Grail are one and the same, however, but that's beside the point here. The story of Parzival begins somewhat dubiously. Parzival's father, Gahmuret, was also a knight in Arthur's service, and ended up killed in Spain by "Babylonian" forces. Keep in mind that the story of Arthur has been heavily imbued with legend and symbolism as well. Parzival's mother, Herzeloyde, then takes the baby Parzival to live in the woods, and shields him from any knowledge of knights, chivalry, or anything like that. So Parzival grows up largely ignorant of a larger world around him, concerned more with his own immediate interests. As time goes on Parzival happens to encounter some knights of the Round Table coming through the woods, and, being knights in armor, he hears them before he sees them. Thinking that devils or monsters are coming, Parzival plans to fight them. When the knights come into view, Parzival is amazed, and asks them if they are angels. The knights regard him as something of a bumpkin, yet do direct him to Arthur's court. Parzival goes running back to Mom, and tells her he wants to go see Arthur and become a Knight. So much for that, thinks his mother, who is still bitter at the loss of her husband due to knighthood. So she dresses him up to make him look as much like an uneducated hick as she can, (a fool, in other words...) and sends him off, thinking no one at the court will take him seriously. So Parzival goes off, ultimately reaching Arthur's castle. On the way out, he finds a knight, the Red Knight specifically, who has challenged Arthur by stealing a golden cup from Arthur, and insulted his Queen by spilling its contents on her. The Knight, who is disputing Arthur's claim over his lands, tells Parzival to deliver his challenge to Arthur, so Parzival does. Arthur then tells Parzival to go after the Red Knight, which Parzival, being kind of gullible, does. He chases down the Red Knight, and demands that he return the cup to Arthur. The Knight, no doubt wondering who this hayseed nutjob is, whacks him with his lance. Parzival kills him in retalitation, and takes his armor, and by extension, his moniker as the Red Knight. Parzival sends a squire to return the cup instead of actually going to return it himself to Arthur, more interested in the Knight's armor and weapons than actually following through. The story continues, but let's examine what we have already. This version of the Fool pretty much sums up what we know of Parzival so far- head in the clouds, naive and walking into possible danger without even knowing it. Parzival, we will find, has good counsel, as the dog represents, warning him away from the cliff's edge as his journey unfolds. What would be contained in Parzival's version of the Fool's bag? Here, we find little except his own ideas and determination to become a Knight. But as time goes on, we find that additional tools are added to the bag. The parallel between Parzival and the Fool really begins when he finally has somewhere to go- prior to this, living his sheltered life, he lacked direction and purpose, and didn't really go anywhere. Yet after he meets the knights and gets it into his head to become a knight, his wandering takes on a definite direction. 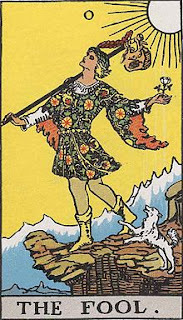 At this point that potential begins to get put to use and put into a definite direction- much as the Fool represents potential, he also needs something to use that potential for. The first person Parzival encounters (we can put the start of his journey at his encounter with the knights) is his mother- a clear Empress figure, both in the positive and negative sense. Herzeloyde doesn't want to let Parzival go, and makes a kind of passive-aggressive attempt to undermine him, wanting to keep him home and safe, here representing the more clinging aspects of the Empress as a mother figure. Yet being a supporting figure, she lets Parzival go. Some accounts of this story have her falling as if in a faint while standing on a bridge watching her son go. Parzival does not turn back however, nor does Herzeloyde demand that he remain, indicating also that regardless of his decision, he always has this source of support. Next up, our unlikely hero gets an encounter with the real world- in many ways, this doesn't seem to sink in or change the fact that our Fool is still living in his own world. The Red Knight is a definite Magician figure, using whatever means are at his disposal to accomplish an end, here challenging and insulting a King much more powerful than him. This also displays the sometimes-ruthless ambition the Magician card so often represents. I find it interesting that there are so often positive and negative aspects to the characters in Parzival's story. Should we condemn the Red Knight and say that he deserved his fate for challenging his King and insulting his Queen, or should we applaud his ambitiousness? Nonetheless, we see that the Red Knight is always ready to take advantage of whatever comes his way, not returning himself to challenge Arthur, but sending Parzival to do it. Ultimately Parzival will come to embody some of the characteristics of the Red Knight (this story runs heavily on symbolism) by taking the Knight's armor and weapons for his own, and by killing the Knight, allowing him to take the Knight's place. Arthur is the next person Parzival encounters, and Arthur is perhaps an Emperor figure- representing the epitome of chivalry, Arthur introduces the still-largely-ignorant Parzival to the strict code of ethics and behavior he and his knights live by, as well as gives Parzival a task to do- go remedy this situation. The Emperor represents order and discipline- the things we need to function in society, which so far Parzival remains largely ignorant of. 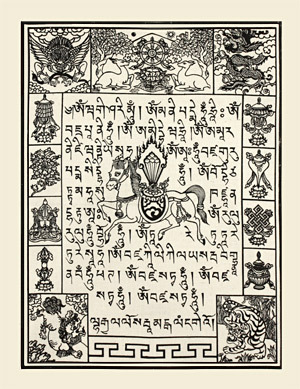 Often termed a father figure (to the Empress' mother figure), the Emperor is also a disciplinarian and teacher, whereas the Empress represents a nurturer and sustainer. Arthur begins to teach Parzival what he needs to do to become a Knight- to move from ignorance and limitations to knowledge and expanding those limitations. Setting back out, Parzival then battles the Knight, and kills him pretty much without thinking. The message here is that Parzival has not yet grasped the nature of the Knight, and still operates on impulse. He does not stop to consider what killing that Knight implies, and does not make any real strategy or battle plan, and in fact wins largely by dumb luck and a chance hit into the Knight's eye with a spear. Nonetheless, Parzival gains the resources of the Magician, here indicated by the armor and weapons of the Knight. Parzival does not actually remove the clothes his mother made for him before putting on the armor (usually armor would be worn with a quilted under-layer, not the medieval equivalent to street clothes). This shows further ignorance, as Parzival may have the things the Magician gave him, but does not fully grasp how to use them, and more than anything else perhaps displays inexperience. Furthermore, Parzival does not return to Arthur, as we might have thought, after defeating the Knight, but rather sends a squire to return the cup- again, indicating that the Emperor still has a good deal to teach him. Nonetheless, we see here primarily that the main thing Parzival lacks is experience, yet is full of potential.